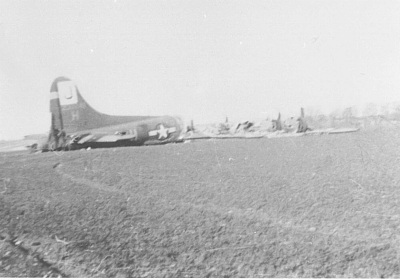 B 17F 42-30246 belly landed near Tirstrup 20/2 1944. 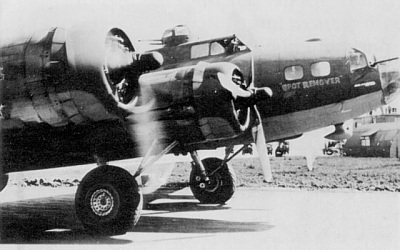 The aircraft belonged to USAAF, 8 Air Force, 390 Bomb Group, 570 Bomb Squadron and was coded DI-H. When 42-30246 which was named “Spot remover” had bombed the target fuel was seen leaking from the aircraft and at 14:20 hours Pilot 1st Lt William M. Gaillard reported on the VHF radio that he was unable to obtain gas from the Tokyo tanks and then left the formation heading for Sweden. 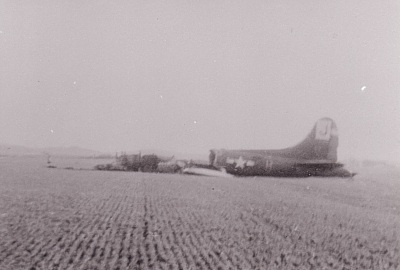 The navigation must have slipped because at approximately 15:30 the B 17 was seen circling the Attrup area east of Tirstrup and at 15:35 it made a belly landing in the frozen fields belonging to Ørupgaard farm. Kjeld Thygesen-Nielsen who lived on the farm ran towards the aircraft but was threatened to stay at a distance by the flyers that was waving their pistols. The flyers were preparing to set the aircraft on fire. Now a civilian dressed German arrived and ran towards the aircraft with a drawn pistol, but soon changed his mind when he saw the armed flyers. The flyers set the aircraft on fire and walked to a small wood north west of the field. Here they divided into two groups and left the area. One group moved towards Rugaard and one group towards Grenaa. In the evening of 20/2 at 19:30 Left Waist Gunner Sgt Jack E. Williams, Tail Gunner Sgt Louis C. Skrzyniecki, Co-Pilot 2nd Lt Gerald E. Steuck and Radio Operator Sgt Raymond E. Quinn were captured by the Wehrmacht near Hyllested. It was the flyers bad luck that the Germans were building a new air base just west of Tirstrup. Due to that there were Germans and German friendly Danes all over the area. Top Turret Gunner S/Sgt John W. Doherty was captured near Hyllested on 21/2 at 10:30 hours. When Bombardier 2nd Lt Francis J. Brodzik, Navigator 2nd Lt Thomas F. Gannon, Right Waist Gunner S/Sgt Joseph I. Sala and Ball Turret Gunner Sgt Peter B. Whitney and Pilot 1st Lt William M. Gaillard were captured is unclear. It is however for certain that some of them had broken into two summerhouses near Grenaa belonging to Doctor Per Laursen and Barrister Sidenius. In Laursens house had been left a pair of flying trousers, a flying helmet and a pair of flying boots and in Sidenius` house was found orange peels which were not common in Denmark in those days. Two of the flyers are known to have been captured by a German patrol on the Rugaard Strand beach when they were discussing the possibility of borrowing a boat from Christian Mourier-Petersen. The day after their capture Williams team was sent to Dulag Luft at Oberursel near Frankfurt for interrogation. After about a week they were sent to Stalag Luft VI Heydekrug where they stayed until summer. Due to the Russian advances they were then moved to what is believed to have been Stalag Luft IV Gross Tychow. In 1945 they were sent to Stalag Nürnberg-Langwasser where they stayed about a month. They were then sent on a 12 day march to Stalag VIIA Moosburg from which they were liberated by American troops in May 1945. Williams returned to USA on 6/6 1945. Sources: MACR, RL 19/458, LBUK, Knud Tygesen Nielsen, Statement Grenaa Police.